Can I Use a Solid Wood Table Top as a Bar/Counter Top? There’s no doubt that our wood tabletops are eye-catching. So much so, in fact, that many customers want to know if they can use them to top their bars or counter tops. Unfortunately, the answer is no, and there’s a good reason. 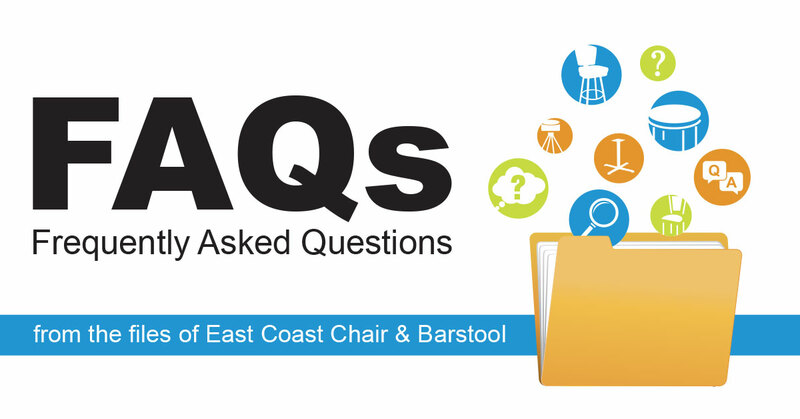 At East Coast Chair & Barstool, we offer a plethora of solid wood table tops that are manufactured with a specific sealing process designed for commercial dining tables, not bar tops. Bar tops are traditionally finished with a thick layer of epoxy to create an impenetrable barrier between liquids and the surface of the wood. While this works well for bars, it tends to take away from the character and overall look of the wood, which is why it is not used for tables. Even with our premium grade finishes, our solid wood tables are not warrantied for the wear and tear like an official bar top. If you have further questions about our solid wood table tops, please give our customer care specialists a call at 800-986-5352. What is Flex Back Seating? When looking at restaurant seating there are a lot of different things to look for. A phrase you might see appearing quite often during your search is the term ‘flex back’. But what exactly is a flex back? 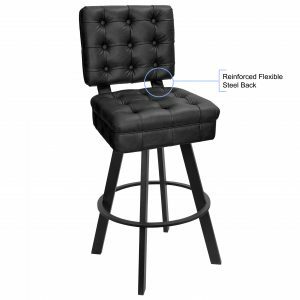 A flex back chair or bar stool has a back that tilts as the person seated moves or applies pressure on the back. So, now you might be asking yourself “what is the benefit of a flex back?” They add comfort to the chair by allowing your customers to lean back and get comfy, instead of hitting the unmoving pieces of a standard back. The piece that allows the back to flex is usually a metal piece that securely connects the seat to the back. It is secure enough to ensure the furniture retains its structural integrity, but also allow for some movement. Studies have shown when customers feel comfortable they stay longer; when they stay longer, they spend more. 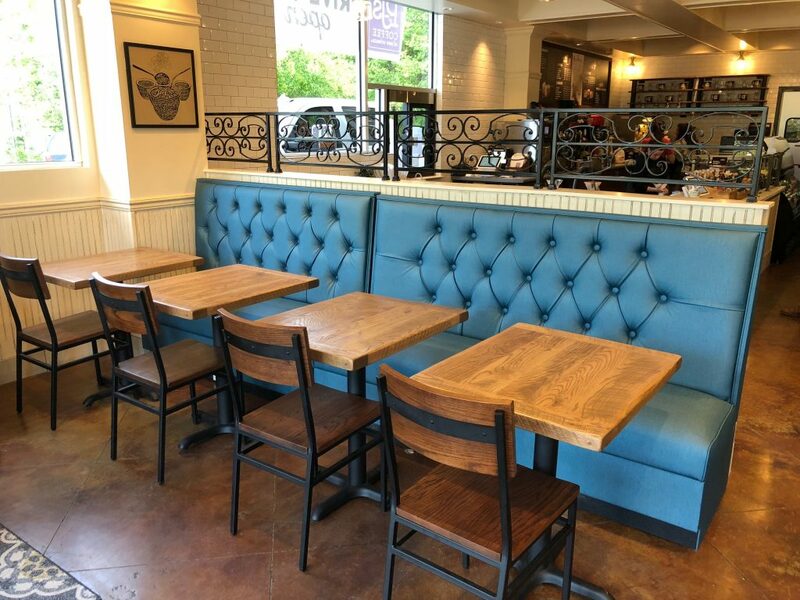 Restaurants with a more formal atmosphere, that want to encourage diners to stay and continue ordering, tend to opt for comfortable furniture with features like flex backs. This is often seen in bucket bar stools where the intent is to keep customers at the bar. Standard and flex back options are both structurally sound and hold similar capacities. Ultimately, a flex back allows for additional comfort for your customers and increased spending potential at your restaurant. Posted on Oct 12, 2018 in Frequently Asked Questions • Comments Off on What is Flex Back Seating? Over the past few years, you may have noticed an increase in large dining tables in restaurants. In the past tables of this size were usually relegated to the family dining room, but now these communal tables are popping up in restaurants all over the country. These tables are used to facilitate communal dining, which is the practice of dining with others, usually accommodating more than one party. While they might be reminiscent of cafeterias and beer halls, they have gotten a facelift in recent years. With both indoor and outdoor options designed to work with current trends, these tables help to complete the look of a restaurant, instead of just being a way to save space. The concept is centered on food and people coming together to share a meal. The sharing of a table helps to break down the barriers of the restaurant and promotes conversation flow among patrons. Most restaurants never dreamed their patrons would tolerate dining with strangers, but it makes good business sense. The large tables allow restaurants to accommodate large groups more easily. Even when the table is split into several parties, it adds seats, creating a good use of space. Many cities with a large “foodie” market have seen great success with communal dining tables. Cities like Boston, Chicago, and New York see small groups come in, sit down, and interact with each other. Then they end up discussing the food and end up buying each other drinks and making new friends. If you have the right space, and think it will work with your concept, there are many options to choose from to fit your look. It is recommended that the tables be large enough to seat from 8 to 12 guests and be at least 30 inches wide to ensure that everyone has enough space for food and electronic devices. 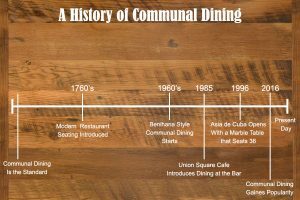 Do you think a communal dining experience would enhance your restaurant? Let us know in the comments below! Posted on Sep 14, 2018 in Frequently Asked Questions • Comments Off on What is Communal Dining? Can You Use Wood Tables Outside? The simple answer here? No, you should not use hardwood table tops outside your restaurant. Hardwood tables can include any sort of oak, maple, beech, cherry, walnut, or untreated pine woods. Wood table tops are commonly used in restaurants because of their durability, strength, and the character they bring to your overall design. But to keep them that way, there are some rules you need to follow. Climate control is crucial for the longevity of wood tables. Wood table tops should be in rooms that are 68°-72° with 40-45% humidity. This is extremely important, even when it comes to adjusting the thermostat (which should be done gradually). Wood tables will crack or warp in rooms where temperatures vary. Abrupt temperature changes, dryness, and humidity can all lead to the wood expanding or contracting, while losing structural integrity. You should also avoid putting wood tables in direct sunlight, next to heat sources (like radiators or ovens), and under bright lighting. Even wood tops in storage should be in a climate-controlled area to retain their original state. Many customers try to put these hardwood tables under a covering, but the real issue isn’t just the weather; it’s the humidity levels. Climate control is crucial when keeping wood tops in their best condition, making it impossible to use them outside because you can’t control the humidity. Another reason why you might not want to use wood tables on your outdoor patio is that you’re likely breaking your warranty for that table top. Before you ever put any furniture in your outdoor space, you’ll want to be sure that furniture item is warrantied for outdoor use. This is the best way to protect the investment you’ve just spent to furnish your restaurant. 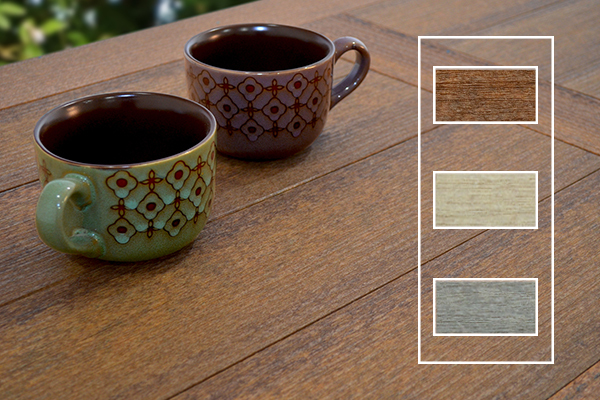 If the wood look is a must for your restaurant or bar, consider wood look-alike. There are many textured poly lumber options out there that have the look and feel of a wood texture, but don’t require the rigorous maintenance. Posted on Jun 15, 2018 in Frequently Asked Questions • Comments Off on Can You Use Wood Tables Outside? When you own a business, restaurant, or hotel, purchasing strong outdoor furniture is key. Buying well-made restaurant furniture can save you from buying replacements after every outdoor season. And buying a patio umbrella is no different. A patio umbrella is an umbrella made to be used heavily in commercial environments with higher grade materials. These umbrellas are made to be more durable and resilient to wind, rain, sun damage, or salt spray. 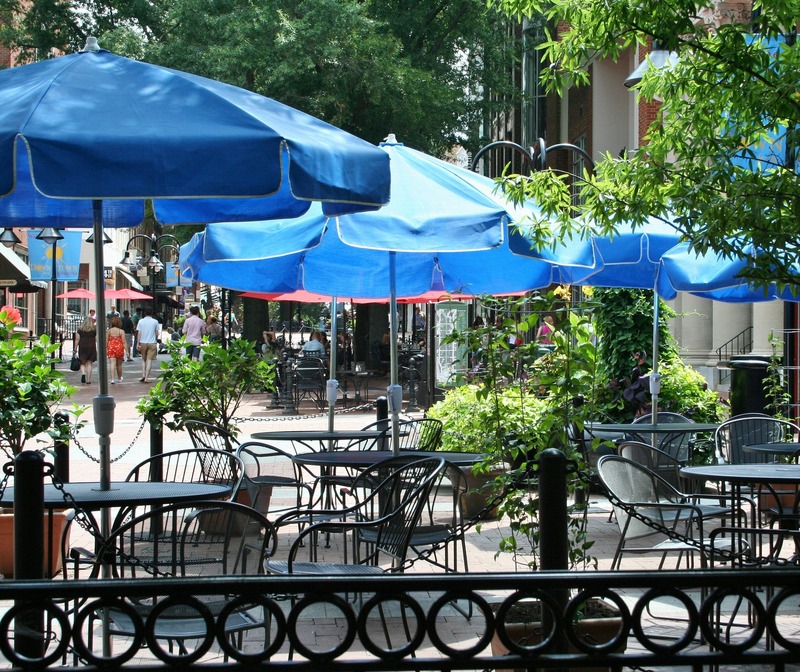 A big difference between commercial patio umbrellas and their residential counterparts is the materials that are used. If you analyze what an umbrella is made of, you’ll have a better understanding if it will give you peace of mind (or not) as a part of your business’s patio. To give your customers a shaded space on your patio year after year, buying lasting umbrellas for your patio is an important investment. This is not a scenario where it’s safe to grab the first umbrella you see at your hardware store. 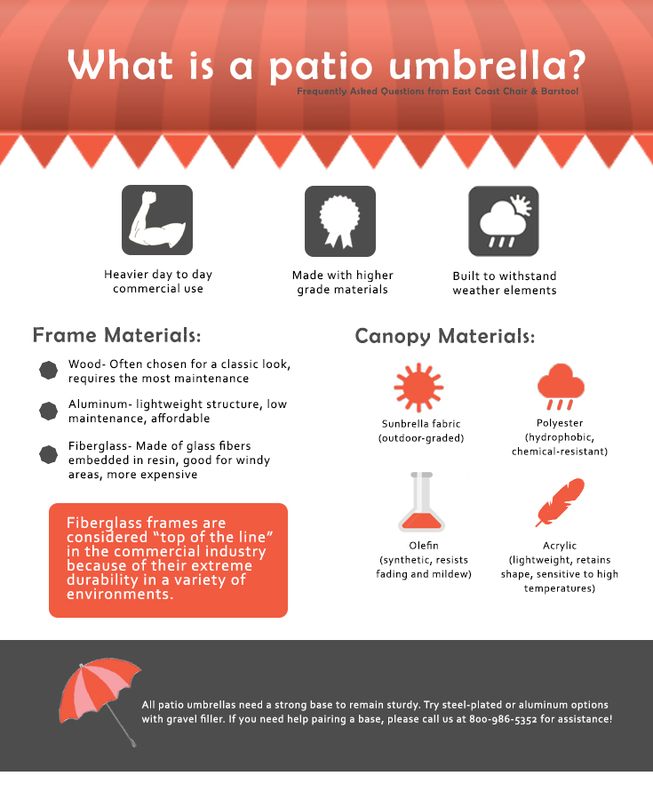 We’ve put together criteria to remember when it comes to purchasing commercial-grade patio umbrellas. How does your umbrella stack up? Sturdy frame- A patio umbrella frame should be made of wood, aluminum, or fiberglass. A traditional plastic is not going to have the same strength as these frames. Wood frames, commonly teak, are often chosen for their classic look but require the most care to retain their original integrity. Aluminum frames offer a lightweight structure that are low maintenance and affordable, which could be a good option for you if you’re buying a high volume. Fiberglass frames rely on strong glass fibers embedded in resin to create a pliable material that thrives in windy areas. Fiberglass frames can be pricier but can hold their worth in the long run when it comes to durability. Canopy fabric quality- Think about it this way. The only thing between your customers and the sun’s rays is the umbrella’s canopy. The fabric quality of your patio umbrella’s canopy, like the frame, should be made with tougher materials for extended use. Canopies should be made from heavy gauge vinyl or marine-grade fabrics like Sunbrella, polyester, or olefin. Materials like these can help better prevent color fading and the breakdown of the fabric. Strong foundation- The wrong base or stand for your patio umbrella can be a liability for your patio. Not only will your umbrella have trouble providing shade, but a weak base can send your umbrella flying. Take note of your patio umbrella’s recommended base weight to accurately choose your base’s material. Consider bases that are steel-plated or aluminum options that use a gravel filler to add weight. The details- Be sure to inspect functional parts that help the umbrella tilt, move, and open. These parts need to be made from a hardy material like a powder coated steel to prevent rusting or breaking off, making it impossible to use the functions of the umbrella safely. If you have any questions about choosing the right umbrella for your patio or pairing a base, please call our customer care team at 800-986-5352 for further assistance. Posted on Apr 13, 2018 in Frequently Asked Questions • Comments Off on What is a Patio Umbrella? What’s the Difference between Outdoor and Indoor Furniture? What makes a piece of furniture better suited for outdoor use versus indoor? The easy answer is the material, but why does it matter from one material to another what goes outside? It’s all about how that material holds up against weather conditions and how often it is used. Of course, you can technically place any outdoor chair inside your restaurant and it’s usable. But should you? The answer is no. Much of outdoor furniture is made from aluminum, a softer metal, that is not up to the heavy traffic of being inside a restaurant. Using an outdoor chair inside will lead to replacing your seating way sooner than you would like. Outdoor furniture is made specifically to hold up to the weather. For example, aluminum is a popular choice for commercial outdoor furniture because it is rust-resistant. Untreated steel does not typically fare as well on patios and will rust when exposed to moisture. Another common example is wood furniture on a patio. It can be tempting to put a reclaimed table top outside, but it is sure to absorb moisture and warp, leaving you out of luck on your investment. You should always pay attention to these warranties to get the most out of your product when you properly use it. Not adhering to a product’s intended use can void the warranty completely, making it very difficult for you to protect yourself as the buyer if something goes wrong. When you invest in restaurant furniture, you want it to be reliable and hold up for your customers. This requires action from you as a business owner to use the product for its intended use. By placing furniture where it doesn’t belong, you can damage the integrity of the furniture without realizing and cause injury to your customers. Protect yourself and your customers by knowing the difference between indoor and outdoor furniture and using them properly. Posted on Mar 23, 2018 in Frequently Asked Questions • Comments Off on What’s the Difference between Outdoor and Indoor Furniture?